Weitere Informationen zu Pentagon’s Mysterious U.F.O. Programm sollen demnächst freigegeben werden und man kann gespannt sein, welche zusätzlichen Details bekannt werden. THE NYT says the location and date had not been released. Update: I-Team Exclusive: Sen. Reid discusses UFO study. More information on the program will be released in next days. The contract was posted for months. The winning bid came from Las Vegas space entrepreneur Robert Bigelow, a billionaire who had funded his own UFO studies for years. Bigelow built secure facilities inside his aerospace company. At its peak, the study had 46 scientists working at the Nevada facility, writing reports and analyzing data that came in from the military. Rapid response teams were dispatched to the scene of UFO events. Over five years, the project cost a total of 22 million. it wasn't a money maker for Bigelow. "I'm sure the reason it helped is that he gave the best cost. He was willing to build the infrastructure and build everything on his own because he liked the topic," Reid says. In some news stories about the UFO study, anonymous staffers say Reid stopped supporting the study because it produced no solid information. So, why did the study end? Reid and others involved in the project say one factor is that intelligence officials were petrified that someone would find out about it and it would end up on the front page of a newspaper. And there were other officials who had religious objections. The I-Team will have more exclusive content Wednesday, including specifics on what was learned during the study, and which UFO incidents were the most unusual. LAS VEGAS - The existence of the UFO study was first reported by the I-Team back in October. That's when a high-ranking intelligence officer in charge of the program quit to take a job with a private company. Over the weekend, news of Harry Reid's role in the study surfaced in news reports. The senator gave his only on camera interview to the I-Team's George Knapp. Harry Reid's interest in UFOs dates back to 1989 because that is when George Knapp first had conversations with him on the topic. In the years since, Reid quietly collected more information, met with scientists, intelligence officials, and other experts, and finally authorized a study that was carried out by a company created by a Las Vegas billionaire. Since the story broke on Saturday, Reid has been bombarded with media requests, but he gave his only on camera interview to the I-Team. The release this weekend of videos recorded by military pilots is unusual because, officially, the U.S. government stopped collecting information about UFOs back in 1969, when the Air Force canceled Project Blue Book. But in the decades since, pilots and others continued to encounter technology that is beyond anything known on earth. "If China, Russia, Japan, other countries are doing this and we're not, then something is wrong because if the technology, as described and the way people see this movement took place in anything we have available to us, it would kill everybody. They couldn't withstand the G-forces. something sitting there, whom, down it goes," says former U.S. Senator Harry Reid. His interest in UFOs extends back to the 1980s. It was rekindled in the 90s when Reid spoke to senator and former astronaut John Glenn about unknown aerial objects. Reid eventually met in a secure room in the U.S. capitol to ask Senators Daniel Inouye and Ted Stevens if they would authorize funds for a quiet but serious study of UFOs. Both agreed. 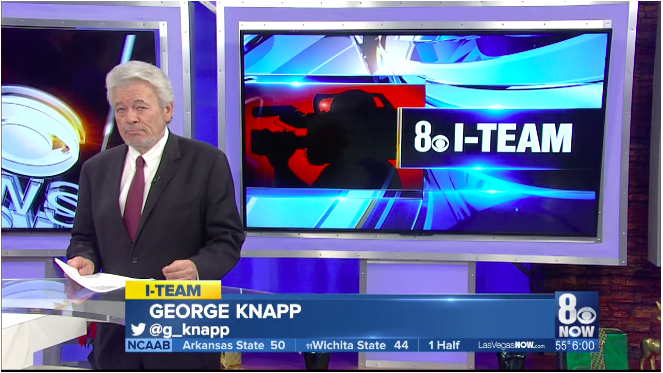 I-Team Reporter George Knapp: "Are you glad the story is out?" Harry Reid: "I'm very glad, because now we have scientific evidence." Reid says he is proud to have had a hand in kickstarting the Pentagon study, and contrary to some media reports, the information collected was impressive. "For nearly the next decade, I ran sensitive aerospace identification program focusing on unidentified aerial technologies, it was in this position that I learned the phenomena is indeed real," says Luis Elizondo, To The Stars Academy. Until three months ago, Elizondo worked directly for the secretary of defense and was the Pentagon's point man for collection of data about mysterious encounters. When he announced in October that he'd been in charge of a 10-year UFO study, the news was largely ignored by mainstream media. Now, it has blossomed into a huge story, in part because Reid acknowledges his own role in getting the funds approved. "Even though this was a secure program,we wanted to make sure people couldn't complain about it that it was some sweetheart deal. No, it was put out to bid," Reid says. If the shape is due to flare, then I suspect it would come from streaks on the outer surface. Maybe from cleaning, or maybe from precipitation+airspeed. So could it be that occasion movement of the coarse outer axes is responsible for the rotation of the shape of the IR flare? It's tracked from 54°L to 6°R, meaning it goes over 0° - which might mean some outer gimbal action was required. There's also a significant change in angle when lock is briefly lost. Plastic is what you need to cover the wavelength range, and also for anisotropic scattering. That does sound like something that would contribute to flare/glare. It would see like the obvious thing to do would be to try to replicate the video. If the military were genuinely interested they could just get one jet to follow another at various distances, and film the whole thing with their ATFLIR. It could be done just as part of normal training. While it is mainly transmission that classifies a material as either an IR or visible material, another important attribute is index of refraction (nd). Index of refraction is the ratio of the speed of light in a vacuum to the speed of light within a given material. It is a means of quantifying the effect of light "slowing down" as it enters a high index medium from a low index medium. It is also indicative of how much light is refracted when obliquely encountering a surface, where more light is refracted as ndincreases (Figure 3). Not when the boss of the AAV investigation bureau with his 20-something million$ is a UFO believer. But that doesn't explain extreme acceleration reported by pilots and ground staff. There's none seen in this video. I'm looking at possible explanations for this video. Why does this UFO rotate? It might be that it's a airplane that's actually rotating, like a fighter jet going into a banked turn, or a flying saucer just ignoring gravity. But it might be something simpler, a rotation of the infrared glare around the engines. We know that infrared glare can look very different to the actual plane, like here where an airbus A340 looks like a giant peanut. We also know the Raytheon ATFLIR is housed behind a glass window that rotates on a gimbal system to keep the object in view. The actual camera is on another gimbal behind the window to keep it level. So what if the occasional rotation of the window caused the glare to rotate? I set up an experiment with an infrared camera pointing at light. I used a lightly smudged glass slide to simulate the window, and I rotated it in front of the camera. The result is a saucer shaped flare, which rotates with the glass. So while this doesn't prove the UFO it's just a distant plane with some infrared glare, it's certainly a possibility to consider. The first rotation of the object happens at 49 seconds while the camera is locked with horizon and clouds baseline. That does not mean the outer gimbal isn't rotating. Just from assembling pieces from this thread and a bit of searching, my take is this video was recorded as part of an operational evaluation for the new sensor pod, and not originally linked to any UFO sighting or incident at all. The first operational Boeing F/A-18E/Fs, due to deploy this week aboard the USS Abraham Lincoln, will be equipped with refurbished engineering development pods rather than production ATFLIRs. 3 - It is plausible that the video is a recording of one plane equipped with ATFLIR maintaining a lock on another plane throughout a banking turn, by use of the ATFLIR's gimbal stabilizers. Hence the name. 4 - Elizondo or others in his program did not know what they were looking at, and in their enthusiasm for UFOs decided this must be the hit they were looking for. This is speculation, but it made the news somehow. Interesting that "GIMBAL" was the filename. My hypothesis is that the rotation is a visual artifact of the gimbal system. It seems a bit of a coincidence that the ATFLIR has a very obvious gimbal system, and this somehow reminded them of the movements of the gimbal.